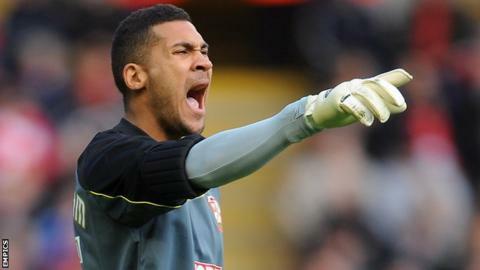 Swindon manager Mark Cooper has admitted he is not surprised goalkeeper Wes Foderingham is attracting interest from other clubs. It has been reported that Championship side Bournemouth have been monitoring the 22-year-old, who is under contract at the County Ground until 2015. "He's a good keeper and he's going to attract attention," said Cooper. "If you play well and if you keep playing well, other teams are going to want you and that always happens." He added: "If the money's right then you know what will happen." When asked by BBC Wiltshire if he would fight to keep hold of the former England youth international, Cooper said: "That won't be down to me. Well, it will be but I'll obviously speak to Lee Power [director] about that. "We have to look at the football club first." A former Fulham youth player, Foderingham had an initial loan spell at Swindon from Crystal Palace before making a permanent switch in January 2012. He has since made 99 appearances for the League One club.